"Hungary for a Coherent Story"
SUNSET is a Hungarian period drama that takes place in Budapest, right before the outbreak of World War I, in a story about a young woman who gets involved in the violent schemes of a brother she never knew existed. Despite sumptuous production values, the story in SUNSET is too incoherent and boring, with a strong Non-Christian worldview and some graphic violence containing a significant amount of blood. A young girl, Irisz Leiter, has returned to the city to try and work at the milliner shop that her parents used to own before they died. This happened when she was just two years old, so she was raised in a girls home, knowing little about her family’s past. When she applies, she is turned down for the job, with the shop manager telling her that Budapest is not the right city for her. That night as she sleeps, a man enters her room and tries to take her. He seems deranged and is yelling that he will take her to the Leiter son. Thankfully, someone intervenes, and the man jumps out of the window escaping. The next day, she can’t stop thinking about what the man was saying about the Leiter son. She begins asking people about her brother, but his name stirs something dark. She finds out he was accused of murdering the husband of a countess and starts investigating the incident. Suddenly, the brother finds her and tells her to leave and never return. She doesn’t listen and follows him as much as she can. She sneaks into the countess’ house and learns that she was abused by her ex-husband. Irisz wants to believe her brother is a good man. However, one night the countess hosts a posh party, with her young son playing the violin. Suddenly, there’s an ambush and robbery led by Irisz’s brother. Amidst the shootout and robbery, her brother takes Irisz her far away to a little shack in the middle of nowhere, trying to convince her that what he and his gang are doing is right. Later, when her brother is sleeping, she runs away. Irisz must figure out on her own what her place is in Budapest. 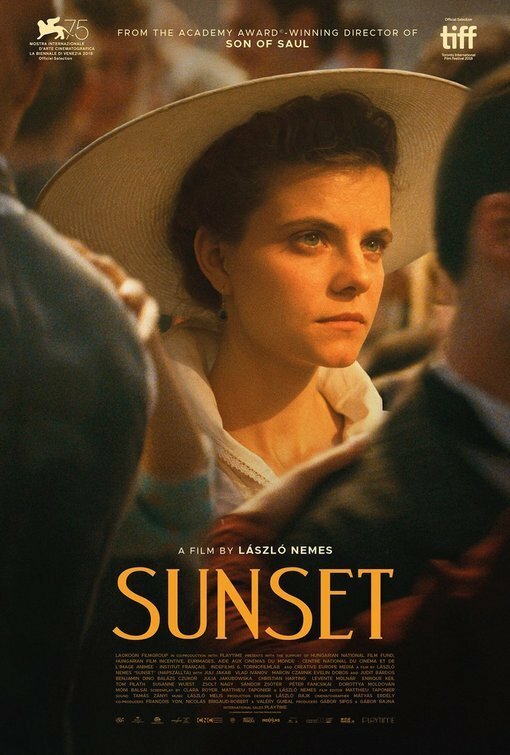 Directed by László Nemes, whose Holocaust movie SON OF SAUL won the Oscar for Best Foreign Language Film in 2016, SUNSET comes with many expectations by fans and critics. However, the story isn’t completely coherent and is filled with many unresolved conflicts and mysteries. It can also feel quite slow, especially with a running time of almost two and a half hours. That said, the production values are quite high, with beautiful sets and costumes, as well as seamless cinematography. Sadly, that’s not enough to keep viewers interested in the story, which never seems to come full circle. SUNSET has a strong Romantic worldview, with no mention of God or a moral compass. The protagonist does whatever she feels like doing, whenever she feels like doing it. She defies the wishes and commands of others, pursuing what will be good for her. SUNSET also has some graphic violence, which includes multiple shooting scenes with a significant amount of blood. SUNSET seems like it might be good, but it isn’t. Strong miscellaneous immorality includes examples of moral relativism, many examples of lying and deception, examples of negative role models and family dysfunction, and stealing. SUNSET is a period drama from Hungary that’s set in Budapest just before the outbreak of World War I. The movie follows a young woman named Irisz who applies to work in a milliner shop that was owned by her parents before they died and still bears her family’s name. The shop manager turns her away, telling her that Budapest isn’t the city for her. That night, she’s attacked by a stranger who tells her he’s going to bring her to her brother. Not knowing she even has a brother, Irisz sets out to find him and gets herself mixed up in something far more complicated than she possibly could have imagined. SUNSET has high production values, but the story is too boring and incoherent, taking viewers down many trails that never resolve themselves. SUNSET has a strong Romantic worldview. The female protagonist does whatever she feels like doing, whenever she feels like doing it. SUNSET also has some graphic violence, which includes multiple shooting scenes with a significant amount of blood. SUNSET seems like it might be good, but it isn’t.